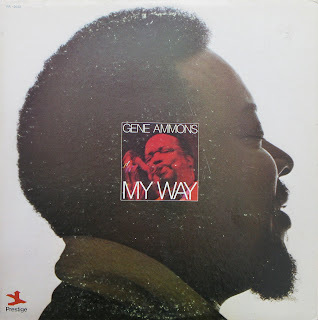 Jazz-funk from saxophonist Gene Ammons, released on Prestige in 1971. The opening track is a real nice groovy number, there's also a couple of slower numbers and a nice version of What's Going On. Back in Mérida is also nice and funky. Players are Gene Ammons and Richard Landry on tenor saxes, Idris Muhammad on drums, Omar Clay on percussion, Roland Hanna on rhodes piano, Ted Dunbar or Billy Butler on guitar, Ron Carter or Chuck Rainey on bass, Robert Prado and Ernie Royal on trumpets, Garnett Brown on trombone plus some voices and strings. another great post.very nice version of whats going on.thanks again for your time. quailty blog. super work you have done with this blog also! Fantastic, can't get enough Gene! Do all of the great jazz albums end up in Europe?!?!?! Another awesome post, thanks Steve. Looks good from the players. Thanks!! Such an amazing lineup! Thank you. Lou Donaldson - Say It Loud!